Arrive in Hanoi and transfer to the centrally located hotel. Free time at leisure. Dinner at a local restaurant. This morning visit Ho Chi Minh’s complex comprising of his Mausoleum and the impressive house on stilts, Ho’s former residence. Later we view the One Pillar Pagoda and learn more about historical and cultural events at the peaceful Temple of Literature, known since the 11th century as the Vietnam’s first university. In the afternoon, we visit the museum of Ethnology, followed by a cycling and walking tour through the bustling Old Quarter. A walk through its narrow exciting streets is fascinating, as we witness different lifestyles and bargain for goods. To finish the day off, we attend the performance of the unique water puppetry. This morning, travel south to Hoa Lu. Further travel brings us to the remains of the ancient capital of Hoa Lu (Ha Long Dry). 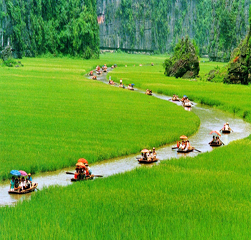 A Temple tour is followed by a rowboat trip through the stunning scenery of Tam Coc, surrounded by Limestone Mountains and known as “Ha Long Bay on Land”. Overnight in Ninh Binh. This morning we depart for Ha Long Bay and board the traditional wooden junk. Set sail on a cruise through the astonishing islands which rise from this tranquil emerald sea. After a sumptuous onboard lunch of special seafood, we explore one of the most beautiful caves in the bay, witness a splendid sunset, then have dinner. Overnight on the boat. We continue exploring the magnificent Ha Long Bay and some of the many caves before our voyage finishes. 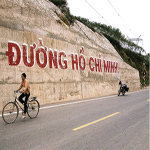 Depart for Bac Ninh Province to learn more about Vietnam history and culture. Visit the Do temple, built during the Le Dynasty, which has been altered several times since. Enjoy a traditional Quan Ho Folk music show before a transfer direct to the airport for the flight to Da Nang city. 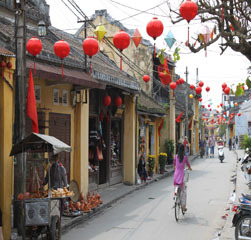 A full day tour in Hoi An is a chance to see the Japanese Bridge, Phuoc Kien Pagoda, the ancient house Tran Phu and the Hoi An museum (Sa Huynh museum or Ceramic museum). In the afternoon we walk in the old town, soak up the atmosphere, experience its original culture, shop for tailor-made clothing, lanterns, shoes and food, or simply relax on the beach. This morning we visit Vietnam’s finest Cham Museum and the Marble Mountain. After crossing the Hai Van Pass, we reach Hue, where we can see the Forbidden Citadel and cruise on the Perfume River to the Old Thien Mu Pagoda. The remainder of our time is free to explore the crowded market of Dong Ba where we can bargain for anything from souvenirs and bronze goods, to Hue sesame sweetmeat and conical poem hats. This morning, we continue to discover Hue by visiting the impressive tombs of King Minh Mang and Tu Duc. Transfer to the airport for flight to Ho Chi Minh City, formerly known as Saigon. Upon arrival transfer to the hotel. Today, we have the opportunity to visit the controversial War Remnants Museum, the Reunification Palace, Notre Dame Cathedral, the Post office and Ben Thanh Market. In the afternoon we drive to the former guerilla base of the Cu Chi tunnels. Here we will gain an insight of the sacrifices and hardships of the Vietnamese people during the French and American Wars. Return to Ho Chi Minh City. In the morning, depart for Vinh Long Province. On arrival at Cai Be, we start the motorized boat to visit the Cai Be floating market and experience how people exchange goods, fruit and many other commodities on their vessels. Cruise through small canals to enjoy the charm of the upper Mekong Delta. Visit An Binh Island where we will take stop to visit an orchard, bonsai garden and tropical fruit garden. Later on, we will see some handmade family business products such as the coconut candy milk, the crispy rice popcorn. Enjoy folk music before the transfer back to Ho Chi Minh City. Free time until the the transfer to Ho Chi Minh airport for onward flight.